We have gathered some frequently asked questions that we’ve received in the past about booking your Maui Kayaking trip and also for your Maui Surf and SUP lessons. If you questions that you may not see here feel free to give us a call at 808-875-4888 or email us at info@tikiteamadventures.com We look forward to hearing from you and look even more forward to having you out on one of our trips or lessons. What if were late or miss the activity? All of our activities have specific check in times and locations. We emphasize to everyone the importance of being on time. This is a courtesy to other participants, and to ensure we are able to complete the tour in time we promised. Know where you’re headed and allow plenty of time to arrive at your destination.If you miss your designated tour, we will try to accommodate as best we can. Our policy is to put you on a standby basis for the next tour available. This may not be your original tour or location however; we will do our best to help out. However, if you missed your designated reservation, there are no guarantees that another will be available. Yes. Either the county of Maui, and / or State of Hawaii issue licenses for commercial activities and we are licensed. Operators must meet certain criteria and have proof of insurance to be permitted. Quite simply – experience and customer service. As one of the most experienced operators on the island, we have attracted excellent guides, have the best equipment, and have a reputation of quality and friendliness. South Pacific Kayaks & Outfitters is proud to be the number one water sports tour operator in Maui! All kayaks used are the sit on top variety. 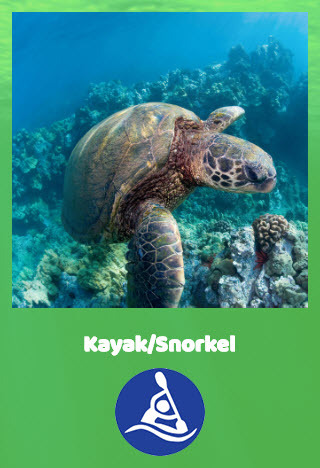 There are stable which makes them perfect for snorkeling – easy to get in and out. We have singles and double kayaks available. Cockpit boats, or sit inside kayaks are not used here on Maui commercially. Why do you go out so early – don’t you know I’m on vacation? The early morning provides the best conditions of the day – calm waters, sunny skies, active reef life and the sun warms instead of burns. Well, Kayaking is quite easy – the biggest issue is for folks who have a hard time sitting up. While all the kayaks have backrests, the participants need to be able to sit up on their own. Other than that, it’s an activity that’s available to all skill levels. Maui has an abundance of sunshine year round. The only thing that keeps us on shore is strong winds or big surf. It’s all an adventure! You can however; there is no guarantee that we will be able to provide service. We strongly recommend reservations. While we don’t have a hard and fast rule, we tend to cap our tours at ten guests. This being said, many people are mixed up on days and arrive for their tour on the wrong day or even the wrong location. We understand and will do our best to accommodate. Your on vacation, we understand. Will I get wet? What should I wear? Yes. All tours will involve snorkeling and of course, we are in a total water environment.We recommend that you dress to get wet all while keeping in mind, comfort, sunshine and mobility. Board shorts and bathing suits are the best option. Many people choose to wear a t shirt or rash guard for more protection from the sun. For your feet, most locations have sandy shores so we typically kick off our shoes prior to launch. Many people have water shoes and they work great too! Absolutely. If you have gear that is comfortable, please bring it – no sense in fitting another set that may not be as comfortable for you. Do you have prescription snorkeling masks? We do have a limited amount of RX lenses. Please ask about this when you reserve your tour. Should I bring my cell phone or digital camera? Any electronics you bring with you should expect to get wet. If you can be away from your cell phone, better safe than sorry. If your camera, etc. is waterproof, bring it along if you need them. If not, we would recommend dropping into the local store and picking up a disposable underwater camera. They work great! What do I do with my car keys, wallet, etc. We always have a dry bag available for car keys, wallets, and personal items you should not leave in your car. We recommend you bring along the basic beach gear which we consider to be: good quality sunscreen, a hat and sunglasses perhaps, bring a beach towel and if you already have snorkel gear (most people rent while they are here) bring that along.We recommend you leave behind personal valuables such as rings, watches, necklaces and the such.Always, for any activity you join, use the restroom (bathroom) at your hotel / condo – they will be more pleasant than the public ones available at the activity site (if there is one there!). Why don’t you have any afternoon trips? In a term – “trade winds”. These are the winds that come along 95% of the time in the afternoon that make the water conditions less desirable. We are concerned about your safety and the quality of your trip. Kayaking is a very popular activity as it combines the ease of paddling, snorkeling from the kayak all in a very quiet and eco friendly way. No big powerboats smelling of diesel, no limitations as to where we anchor, etc.Kayaking requires all participants to actively participate. This is what makes kayaking so great! Everyone gets a real sense of what they’re doing and it can quickly become a favorite activity – even back home! Can my kids come / participate? We have tours available for families with kids as young as five and up (5)+. Many of our guides have kids so they can easily understand the specific needs of families. All kayaks naturally have weight limits. With singles, the capacity is 300lbs, and doubles 500lbs. When reserving, it’s best to let your agent know if this is a concern. What’s included with the tour? What’s not included? All tours include: Kayak equipment, snorkel equipment, bottle water, juice and snack bars. Some longer tours also include lunch and treats.Not included: guide gratuity, taxes, and personal items such as towels, sunscreen, etc. Yes we do. See our kayak rental information page. If considering renting, please consider that this is the ocean we are on – a moving body of water with only one shore close by. The ocean is much more dynamic that rivers or lakes so make sure you are comfortable on the water and can be responsible for yourselves. We stress – this is not a lake or river. We have a variety of sites for surfing. See our surfing page. Best spot is Kalama Park in Kihei because of the long gentle rolling wave and the “friendly” bottom there. Great for kids! What type of surf boards do you use for lessons? We use soft top surfboards. These are appropriate for learning as they provide lots of flotation and support to keep you surfing. You should be comfortable in the water. The lessons themselves take place in chest deep water. Please be dressed to get wet. Ideally, you have a swimsuit. Guys wear board shorts, and ladies we recommend a one piece bathing suit. Also, sunscreen! What’s provided with the lessons? What should I bring? We provide the soft top surfboard, rash guard and booties. You would supply your own sunscreen and beach towel. What makes you different that other surf schools? We are one of the most experienced water sports company and as such, have a great pool of instructors, equipment and good old fashion customer service! We are also one of the few commercially licensed surf providers with Maui county. Is this OK for first timers? I’ve never surfed before. Surf Lessons / instruction is the way to go. Joining a lesson will get you up and surfing much quicker and having you enjoying Maui’s great surf sooner. 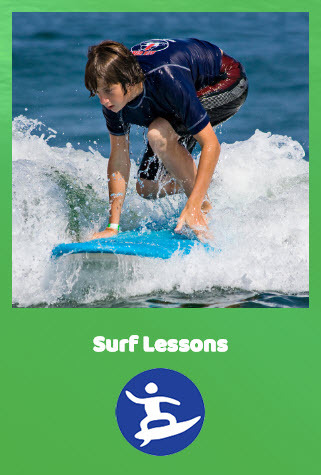 Our instructors provide all the know how you would otherwise miss thereby getting your surfing your very first lesson.